The European Union (EU) is currently on track to meet its 20 % energy efficiency target for 2020. In 2014, its primary energy consumption (the total demand in energy) was 12.0 % below 2005 levels. Continuing this downwards trend at the same pace until 2020 would be sufficient for the EU to achieve its absolute primary energy consumption target, which is equivalent to a reduction of 13.4 % compared with 2005 levels. Preliminary estimates from the European Environment Agency (EEA) indicate that primary energy consumption increased by 1 % in 2015, back to 11 % below the 2005 level. Despite this slight increase, the EU remained on track to achieve its 2020 target on primary energy consumption. With regard to final energy consumption (which includes all energy delivered to final users but excludes the energy used by the energy industries themselves), in 2014 the EU had already decreased its final energy consumption to a level below its 2020 target. The reductions in the EU’s energy consumption between 2005 and 2014 reflect the combined effects of the energy efficiency policies implemented across the EU and the continuing effects of the economic recession. Furthermore, the energy demand in 2014 was exceptionally low because of favourable climatic conditions (i.e. a particularly warm winter) which limited the energy demand for heating in Member States. As economies pick up again and the population continues to grow in some Member States, further efforts will be necessary to ensure that energy consumption continues to decrease. The EU’s current 27 % energy efficiency target for 2030 will be reached if the reduction in primary energy consumption continues at the same pace as that achieved since 2005 to reach the 2020 target. Achieving the 2030 target in final energy consumption would require only a total reduction of 2.2 % from 2014 levels. The European Union (EU) is currently on track to achieve its target of improving energy efficiency by 20 % by 2020. In 2014, it had reduced its primary  and final  energy consumption by 12.0 % and 10.9 %, respectively, compared with 2005 levels. According to preliminary estimates from the European Environment Agency (EEA), the EU’s primary energy consumption increased slightly in 2015 (by 1 % compared with 2014) and final energy consumption increased by 2.5 % (EEA, 2016a and 2016b). The Energy Efficiency Directive (EED) defines the EU energy efficiency target for 2020, which can be expressed in terms of either primary energy consumption or final energy consumption (EU, 2012). Meeting the target will require energy savings of 20 % from levels projected for 2020 in the Commission’s Energy Baseline Scenario (EC, 2008). The present analysis tracks progress towards the 2020 targets by measuring energy consumption against 2005 levels. Using this reference year allows consistency in the assessment towards 2020 climate and energy targets across the whole report, since 2005 is the base year for expressing national greenhouse gas (GHG) targets under the Effort Sharing Decision (ESD), as well as national targets under the Renewable Energy Directive (RED). The year 2005 is also a relevant starting point for monitoring trends in energy consumption, since, along with 2006, it is one of the two years in which EU energy consumption reached its highest levels ever. The EU’s 2020 target expressed in terms of final energy consumption corresponds to an 8.8 % reduction from 2005 levels. In 2014, the EU had reduced its final energy consumption by 10.9 % compared with 2005 levels, to levels below the target set for 2020. This corresponds to an annual decrease of 1.2 % per year on average (see Figure 6.1). The decrease in final energy consumption between 2005 and 2014 was influenced by a number of factors, such as structural changes towards less energy-intensive industrial sectors, improvements in end-use efficiency, lower energy consumption in the transport sector, as well as the economic recession (Odyssee-Mure, 2015). Furthermore, final energy consumption decreased by 4.1 % in just one year, between 2013 and 2014. The year 2014 was exceptionally warm, which resulted in less demand for heating in Member States than in previous years. The EU’s 2020 target expressed in terms of primary energy consumption is equivalent to a 13.4 % reduction from 2005 levels. In 2014, the EU’s primary energy consumption was 11.8 % lower than in 2005. The average annual reduction in the EU’s primary energy consumption between 2005 and 2014 (of 1.3 % per year) was more than the average annual reduction required to achieve the 2020 target (of 0.9 % per year between 2005 and 2020). In other words, in 2014, the EU’s primary energy consumption was below an indicative linear trajectory drawn between the actual consumption level in 2005 and the targeted level for 2020. According to preliminary estimates from the EEA, the EU’s primary energy consumption slightly increased in 2015 (by 1 % compared with 2014), although it still remained below the indicative linear trajectory (EEA, 2016b). The efficiency of the conversion of primary sources (e.g. coal and gas) into final energy has improved. The proportion of thermal generation (excluding combined heat and power (CHP)) has decreased. The proportion of nuclear energy has decreased: the conversion efficiency of nuclear technology is considered lower than the average efficiency of thermal generation, so a decrease in the proportion of nuclear energy statistically improves the overall conversion efficiency of the energy system. There proportion of renewable sources for electricity production (such as hydro, solar photovoltaic, wave and tidal, and wind) has increased: these renewable energy sources are considered to have 100 % transformation efficiency, so an increasing proportion statistically improves the overall conversion efficiency of the system. The increase in the consumption of renewables from 2005 — and the subsequent substitution of fossil fuels — is estimated to have contributed to a 2.0 % reduction in primary energy consumption in 2014 (EEA, 2014). Note: The 2020 target represents energy savings of 20 % from levels projected for 2020 in the Commission’s Energy Baseline Scenario (EC, 2008). The indicative 2030 energy efficiency target represents an improved energy efficiency of at least 27 % compared with 2030 projections in the same Energy Baseline Scenario. Source: EC, 2008; European Council, 2014; EEA, 2016a and 2016b; Eurostat, 2016a, 2016b and 2016c. No mechanism currently requires Member States to regularly report projections of their energy consumption levels. Assessing the projected progress of Member States ‚— and subsequently of the EU — towards their energy efficiency targets based on Member States information, as is done for GHG emissions, is therefore not possible. The EU will achieve its 2020 target on energy efficiency if the average annual decreases in primary and final energy consumption observed between 2005 and 2014 are maintained until 2020. This, however, may prove challenging considering the potential effects of an economic recovery and demographic trends on future energy consumption trends. In its assessment of progress made by Member States towards the national energy efficiency targets for 2020, the European Commission concluded that, despite the achievements of previous years, additional efforts are needed, particularly in the building, transport and generation sectors. To close the remaining gap between current levels and the 2020 primary energy consumption target, Member States should accelerate their efforts in order to achieve their national energy efficiency targets for 2020, or go beyond them. In October 2014, the European Council endorsed an indicative energy efficiency target of at least 27 % for 2030, in comparison with the 2020 Energy Baseline Scenario target of the European Commission (European Council, 2014). This Energy Baseline Scenario, based on the Price-driven and Agent-based Simulation of Markets Energy System Models (PRIMES), was used to set the 20 % target for 2020 (EC, 2011). a final energy consumption of 1 039 Mtoe, which is 13 % lower than in 2005 — this translates to a 0.4 % average annual decrease between the 2020 target and 2030 (compared with the 0.6 % average annual reduction between 2005 and the 2020 target). Considering this, actual reduction targets for 2030 are less ambitious than those for 2020 because the average annual reduction rates are lower than those required for the achievement of the 2020 targets. A 27 % energy efficiency target could be reached by 2030 by continuing, beyond 2020, the efforts made to reduce the EU’s primary energy consumption between 2005 and 2020. Achieving the final energy consumption target in 2030 requires only a 2.2 % reduction from 2014 levels. The target will be reviewed in 2016, following a review of the EED. A 30 % improvement of energy efficiency by 2030 would correspond to a 23 % decrease in primary energy consumption or to a 16 % decrease in final energy consumption, compared with 2005. Individual Member States are also free to set their own higher national targets. Primary energy in the context of the EED means gross inland energy consumption minus non‑energy use. Primary energy consumption measures the total energy demand of a country. It covers consumption of the energy sector itself, losses during the transformation (for example, from oil or gas into electricity) and distribution of energy, and final consumption by end users. It excludes energy carriers used for non-energy purposes (such as petroleum used not for combustion but for producing plastics). 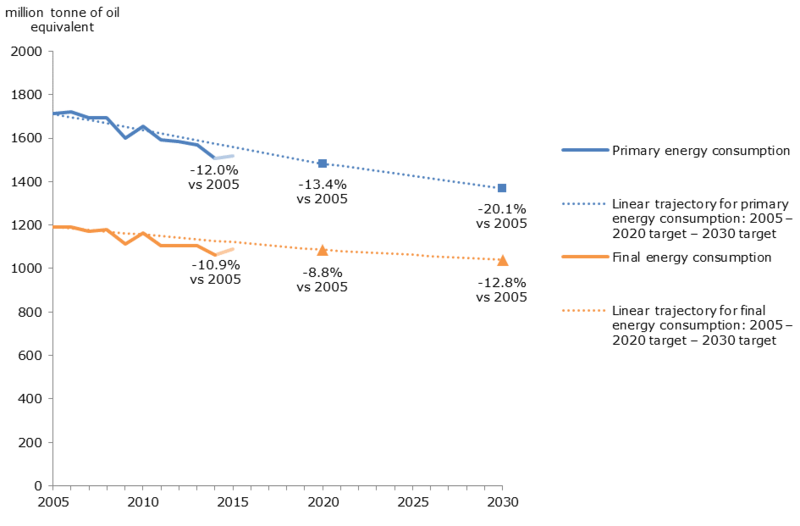 EC, 2008, European energy and transport: Trends to 2030 — update 2007, European Commission (https://ec.europa.eu/energy/sites/ener/files/documents/trends_to_2030_update_2007.pdf) accessed 17 September 2015. EC, 2011, Impact assessment accompanying the document ‘Directive of the European Parliament and of the Council on energy efficiency and amending and subsequently repealing Directives 2004/8/EC and 2006/32/EC’, Commission Staff Working Paper SEC(2011) 779 final (http://eur-lex.europa.eu/resource.html?uri=cellar:4bc8ec58-3689-4044-811c-0435b28f8464.0001.01/DOC_2&format=PDF) accessed 30 July 2015. EEA, 2014, Trends and projections in Europe 2014, EEA Report No 6/2014, European Environment Agency (http://www.eea.europa.eu/publications/trends-and-projections-in-europe-2014) accessed 14 October 2016. EEA, 2016a, ‘Final energy consumption by sector and fuel (CSI 027/ENER 016)’, European Environment Agency (http://www.eea.europa.eu/data-and-maps/indicators/final-energy-consumption-by-sector-9/assessment). EEA, 2016b, ‘Primary energy consumption by fuel (CSI 029/ENER 026)’, European Environment Agency (http://www.eea.europa.eu/data-and-maps/indicators/primary-energy-consumption-by-fuel-6/assessment). EU, 2012, Directive 2012/27/EU of the European Parliament and of the Council of 25 October 2012 on energy efficiency, amending Directives 2009/125/EC and 2010/30/EU and repealing Directives 2004/8/EC and 2006/32/EC (OJ L 315, 14.11.2012, p. 1) (http://eur-lex.europa.eu/eli/dir/2012/27/oj) accessed 25 June 2014. European Council, 2014, Conclusions on 2030 Climate and Energy Policy Framework, EUCO 169/14, European Council (http://www.consilium.europa.eu/uedocs/cms_data/docs/pressdata/en/ec/145397.pdf) accessed 9 September 2015. Eurostat, 2016a, ‘Final energy consumption’, Simplified energy balances - annual data [nrg_100a], code B_101700, Eurostat (http://ec.europa.eu/eurostat/tgm/table.do?tab=table&init=1&language=en&pcode=tsdcc320&plugin=1) accessed 14 October 2016. Eurostat, 2016b, ‘Final non-energy consumption’, Simplified energy balances - annual data [nrg_100a], code B_101600, Eurostat (http://ec.europa.eu/eurostat/tgm/table.do?tab=table&init=1&language=en&pcode=tsdcc320&plugin=1) accessed 14 October 2016. Eurostat, 2016c, ‘Gross inland energy consumption’, Simplified energy balances - annual data [nrg_100a], code B_100900, Eurostat (http://ec.europa.eu/eurostat/tgm/table.do?tab=table&init=1&language=en&pcode=tsdcc320&plugin=1) accessed 14 October 2016. Odyssee-Mure, 2015, Monitoring of energy efficiency trends and policies in the EU, Odyssee-mure (http://www.odyssee-mure.eu/publications/br/synthesis-energy-efficiency-trends-policies.pdf) accessed 14 October 2016. For references, please go to https://www.eea.europa.eu/themes/climate/trends-and-projections-in-europe/trends-and-projections-in-europe-2016/6-progress-of-the-european or scan the QR code.